This Valentine’s Day, hearts won’t be the only thing aflutter—brains, intestines, and other internal organs are sure to fly as The Walking Dead makes its much-anticipated midseason premiere. When we last checked in on our merry band of survivors, things were not looking so hot in Alexandria and, as far as we can tell, they’ll only be getting much worse in the back half of season six. It can all be a bit stressful, and since we here at The A.V. Club aren’t (entirely) heartless monsters, we’re teaming up with the official Walking Dead store for a special sweepstakes that should lift your spirits. 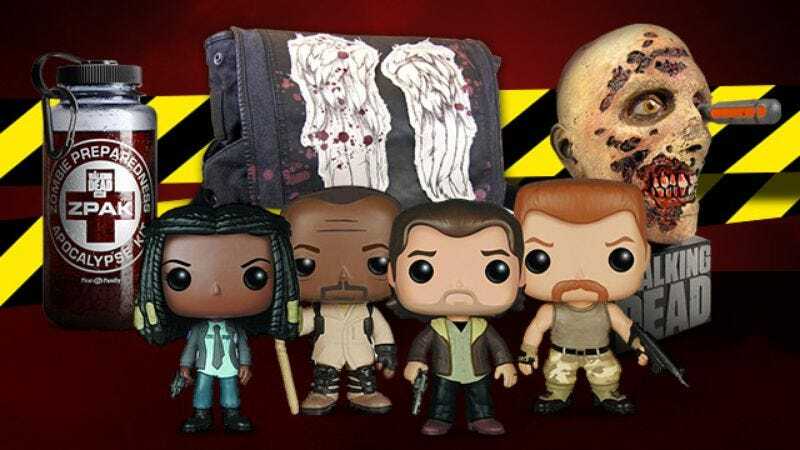 We’re offering our readers an exclusive opportunity to win this one-of-a-kind Walking Dead prize package, featuring the limited edition season two “Zombie Head Screwdriver” Blu-ray box set, official Z-Pak apocalypse kit, a “Dixon wings” messenger bag, and a collection of four Pop! Vinyl figures. To enter, simply fill out the form below with your information. The contest closes at midnight Eastern on Monday, February 15, so be sure to enter before Valentine’s Day is over. A full list of official rules, terms, and conditions can be found below. Estimated retail value of the prize package is $400. Find out details about the prizes and more at the Walking Dead official store.